The Klezmatics/ Rise Up! Shteyt Oyf! Joseph Roth's The Wandering Jews (2001, Granta — a translation of the original 1926 German-language edition) offers some edifying reflections on music in pre-Holocaust Eastern European Jewish life. Musicians, says Roth, "are very poor, because they live off the joys of strangers." Some things haven't changed. Others have. 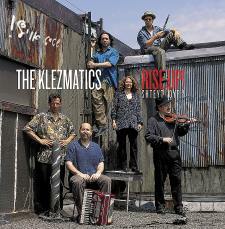 Consider the new Klezmatics album, Rise Up! Coming a bit more than a year after the New York and Washington attacks, its release is no ordinary event. In the album notes, Public Radio International host Ellen Kushner writes of a year of struggle and loss: "We lost 3,000 fellow-citizens, we lost hope and we lost heart, and for a while we even lost the music." But in these uneasy times, phoenix-like, Rise Up! offers spirited testimony to human resilience, against what is shaping up as an enduring humanitarian struggle against ignorance, fear and ethnocentric hatred. Rise Up! 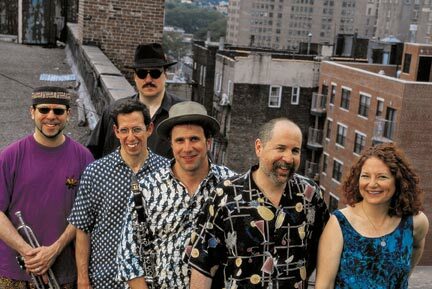 confirms the Klezmatics' status, since their 1986 founding, as one of the most innovative and provocative voices of klezmer and avant-garde Jewish music. Illustrating their eclectic musical interests, four tracks come from the Pilobolus Dance Theatre's Davenen score (music by trumpeter Frank London). "Klezmorimlekh Mayne Libinke" ("Beloved Klezmorim, My Dear Ones"), a traditional tune, opens the album in prayer-like fashion, borne aloft on singer Lorin Sklamberg's exquisite tenor. "Kats un Moyz" ("Cat and Mouse") has a distinctive Latin-jazz drive, especially in David Licht's percussion, and the straight-ahead piano montuno of guest Steve Sandberg. "Hevl Iz Havolim" ("Vanity Is Vanities") achieves a tantalizing balance between Sklamberg's plaintive vocals, Darriau's airy kaval (flute) and wailing clarinet, and Lisa Gutkin's adroit violin, over an insistent piano and percussion foundation. The traditional Yiddish text can be read as a pointed commentary on the latest crisis of corporate criminality. And the world runs on money. "Davenen" ("Prayers"), an instrumental, blends violin and kaval in the upper register against a simple piano and tsimbl underpinning, giving way to London's rueful, evocative trumpet. Another instrumental, "Di Gayster" ("The Ghosts"), composed by Darriau, sets up a gorgeous interplay between piano, Paul Morrissett's ringing tsimbl, and Darriau's ethereal kaval, suggesting great lamentations, a haunted Kaddish for the hovering spirits of disappeared humanity. "Bulgars #2," an essay in musical evolution, with its opening accordion-tsimbl-violin interplay, harkens back to nineteenth-century Eastern European dance, moving through klezmer history from Joseph Moskowitz-Abe Schwartz territory to the more contemporary North American sound of the clarinet, trumpet and percussion. To chant The Song of Songs. When I get to "yishokeyni,"
Now knows the Holy Tongue. If that is not enough to spark authoritarian ire, the album centerpiece should arouse the unreflective "patriotism" of all who would shoot first and (maybe) ask questions later. Holly Near's eerily prophetic "I Ain't Afraid" (from Edge, her latest, released a month before the US Supreme Court appointed the present Pennsylvania Avenue potentate) assumes form as a powerful gospel choir. Sung in Yiddish and English (and reprised to close the album), it stakes out an unequivocal spiritual and political position. Are the ones who will impose it on you. The spirit of your love, it's killing us. In the name of your god. Against extremist sentiment of every stripe, "Yo Riboyn Olam" ("Creator, Master of This World") is a song of fervent devotion, a pacifist vision of an enduring ecumenical peace in Jerusalem, as the international cultural capital it has been for most of its history. Lorin Sklamberg gives loving voice to divine yearning, coming as close as a secular artist can aspire to the cantorial sublime. An evocative Middle Eastern feel comes from a jagged blend of choral voices, plus guests Myra Melford (a sublimely evocative harmonium) and (on percussion) Aaron Alexander, Samard Walker-Butler and Jacob Heifetz-Licht. Sklamberg opens up another sphere of devotional ecstasy on his own (ironically titled?) composition, "St. John's Nign" (a wordless song of ecstasy). Its accelerating chorus ("Dai dai dai," like "Daiyenu," the Passover song) and keening clarinet cry out, "Enough! It is enough!" And so it is, in this treacherous era, that Rise Up! renounces all manner of high unholy madness: messianic politics, the self-righteous fire-and-brimstone moralizing, fascist faith, a demagogic language of enemies and evildoers, covert secular crusades, clandestine detention and inquisition sans habeas corpus, deception and hypocrisy, the dismissive pre-meditated assurance of sanitized mass murder, all on a mission from god. I had the opportunity to see the Klezmatics perform most of the material on Rise Up! at the summer 2002 Nürnberg Bardentreffen Fest, a multikulti (as Germans say) weekend of live outdoor music. Artists converge from all over the planet to perform at a half-dozen free street venues throughout the extensive pedestrian zone. In this medieval city (emerging from its own sinister National Socialist history), the band captivated listeners from a stage nearby the memorial where the former Nürnberg synagogue stood, destroyed as a prelude to Kristallnacht in 1938. Sixty-odd years later, before a rapt crowd, in a country that cannot get enough of klezmer, the paradox and pathos of this historical juxtaposition was manifest.